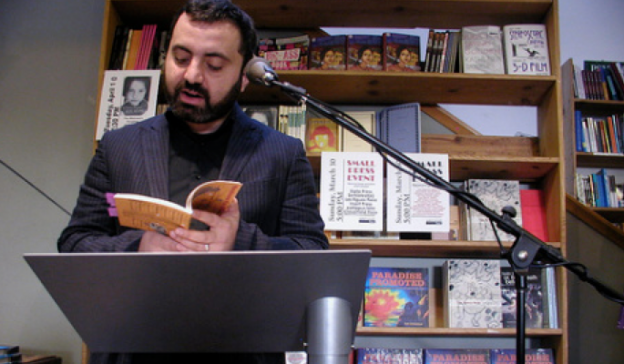 Ara Shirinyan is a poet and publisher living in Los Angeles. He runs Make Now Press and is a co-founder of the Poetic Research Bureau with Joseph Mosconi and Andrew Maxell. The PRB hosts a long-running reading series, publishes books, puts on exhibits, and generally advocates for experimental writing culture. Ara is also a co-founder of The Smell, a legendary L.A. punk venue. Ara’s books include Syria Is in the World (Palm Press, 2007), Your Country Is Great: Afghanistan-Guyana (Futurepoem Books, 2008), and Julia's Wilderness (Poetic Research Bureau, 2014). You should check out Eric Rettberg’s recent essay on Shirinyan in Jacket2, "Laughing at Your Country is Great." Into the Field is a series of interviews with poets & poetry people: critics, teachers, publishers, organizers, & fans. Produced and hosted by Stephen McLaughlin.